The Daydream View is finally here. Unveiled at a press event last month, Google’s Daydream View headset is now on sale from retailers like Best Buy, Verizon, and Google’s own store. Powered by the Google Pixel phone (the first Daydream ready phone), Daydream View is the tech giant’s solution to bringing VR to mass consumers with a more comfortable and simple mobile VR system — all for the price of $79. Like the Google Cardboard and Gear VR, Daydream View is powered by your phone (in this case a Google Pixel or Pixel XL device). Your mobile device cradles into the front of the headset, using the phone’s display and computing hardware to immerse you in VR. This is more than just a gussied up Cardboard VR viewer that feels like you’re wearing a pair of soft yoga pants on your face. The Daydream View and Pixel phone recognize each other through NFC and automatically pair and orient together. No more fiddling with the phone to line up the lenses like we’ve all experienced with a Cardboard viewer. Much has already been covered about the actual Daydream View headset that comes with its own wireless controller and adds the ability to track hand movement as well as letting you interact in VR. But now with some extended use under my belt, I can say that it is a comfortable VR headset. It’s lightweight, fit snuggly over eyeglasses, and touts a breathable facepad that didn’t feel like it was pressing down on my face the entire time. There was more light leak than expected from the sides of the headset, but it didn’t seem to be a significant hit on app experiences. The Daydream View is simple — and so is the Daydream platform. Once you’ve download Google Daydream to your device, it’s an entirely painless experience to get started. Daydream is Google’s Android-based platform that includes both software and hardware specifications, designating compatible phones “Daydream-Ready”. Daydream is also the home for all the VR apps and experiences you download to your device. As soon as you place your phone on the tray of the Daydream View headset, you will be prompted to install the Daydream app. Once complete, you can discover VR apps available at launch on the device by browsing the Google Play store — a delightful part is the 360° preview thumbnails for each app, letting you move the device around and get an immersive snapshot of what you’re about to dive into. You can also drop your phone into the Daydream View and navigate apps from the Daydream Home screen in VR. It’s that beautiful low poly forest environment that Google has been touting in most of their marketing. You can access the Play Store in VR from Daydream Home and navigate to any app listing page to install from there. It’s probably not fair to compare Daydream to Oculus’s platform on the Gear VR since this is launch day and there just aren’t that many apps available yet. But Google is launching with a handful of their own apps to get your adventure started. 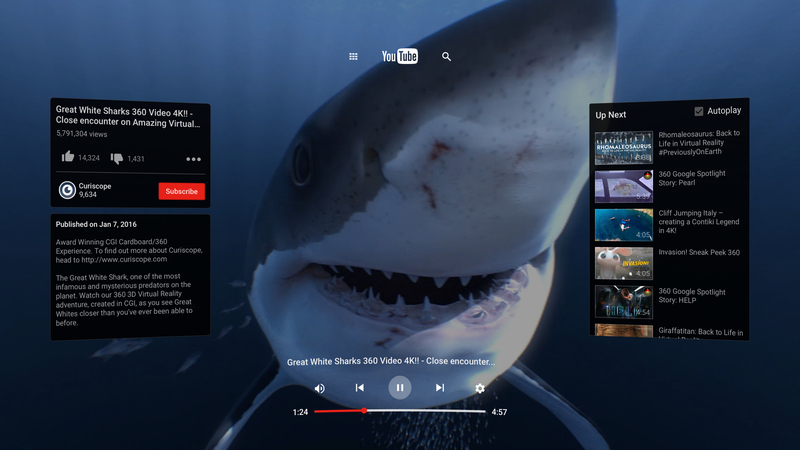 YouTube (FREE) — Experience the videos you know and love as new immersive 360° content for VR. You can experience real-world sound with spatial audio, browse your personalized subscriptions, as well as browse and watch a video at the same time. Street View (FREE) — Visit over 70 countries and experience 150 handcrafted tours of the world’s most amazing places. Play Movies (FREE) — Your personal cinema with thousands of popular movies and TV shows to choose from. Google Photos (FREE) — Relive memories by stepping inside your VR photos and panoramas — your VR photos taken with the Cardboard Camera app can now be experienced just the way intended. Google Arts & Culture (FREE) — View artworks curated by museums from around the world, zoom-in to see extraordinary detail, and listen to audio guides of masterpieces. Wonderglade (FREE) — You’re magically teleported to an ever growing theme park where you can enjoy carnival-themed classic games. Using Daydream View’s controller, you can putt, tilt, spray, spin and laugh your way through all the levels. Mekorama ($3.99) — In this game, you’ll help a tiny robot stumble home through 50 puzzling mechanical dioramas. Star Chart VR ($4.99) — You’ll explore the solar system in a beautiful and accurate real-time space simulation, from the Sun to the smallest moons of Saturn and out to the coldest, darkest, farthest reaches of Pluto. Hunters Gate ($5.99) — The classic shooter has been reinvented for a completely new VR experience where you’ll blast your way through the town of Hunters Gate as either Forge (a lucky gunslinger) or Payne (a revenge driven mage) as you defend it from demon invasion. Unlock and upgrade powerful weapons, spells, and Hunter skills. Hunters Gate also offers co-op play over local Wi-Fi and hours of procedural content. Wall Street Journal (FREE) — The Wall Street Journal VR app offers reporting and analysis combining breaking news, a real-time interactive market data visualization, and 360 interactive videos in an immersive virtual reality experience. Fantastic Beasts (FREE) — Enter into a new era of magic with Fantastic Beasts and Where to Find Them, in an immersive virtual reality experience. Step into Newt Scamander’s case to interact with beasts, complete spells and explore a new era of the Wizarding World. EarthShape ($4.99) — EarthShape is a point-and-bounce universal puzzle game. Grow heroic flowers across hundreds of alien worlds as you rack up points and discover millions of gene combinations. Danger Goat ($5.99)— Your goat is in danger! Help him escape! Use the Daydream controller to protect the goat from dastardly traps across a world of fiendish puzzles. VR Karts (FREE) — The checkered flag is about to drop on a new Virtual Reality racing game! Get in the driver’s seat, race through stunning environments, collect power-ups and battle for first place. Let’s race! Designed with comfort in mind, it’s hard to ignore the price of the Daydream View. Coming in under $80, this may be exactly what we’ve all been waiting for to bring virtual reality to a larger consumer audience. Although just a couple phones now, as more Daydream Ready devices begin to roll-out, we can expect many more to be rocking this fashion statement on their face.